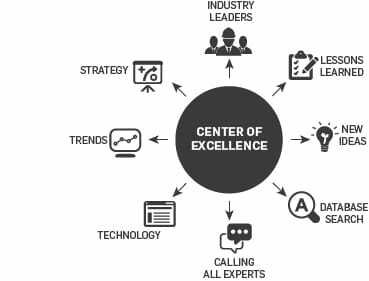 Our Centers of Excellence (COEs) are national groups of seasoned professionals who are experts in their client sectors and who lead innovative service improvements. Want to compare cost trending information from our estimators or review best practices in quality management from our field superintendents? You can, by leveraging information on current trends, sustainable design practices, construction solutions, equipment, technology, operational issues, costs and vendors, to match the unique requirements of your market. From Lean construction management approaches to innovative cost modeling methods to sophisticated technology solutions, our Center of Excellence leaders and their highly skilled teams draw from vast bodies of knowledge and portfolios of work from all over the world to ensure we meet each client’s individual needs. Gilbane’s Centers of Excellence (COEs) bring together Gilbane’s top professionals, each of whom are experts in their markets/disciplines, to share best practices and stay ahead of the newest thinking and cutting-edge trends in their fields for the benefit of our clients. Center of Excellence teams deliver experience and facility solutions from similar projects globally to ensure that we can create the very best facility for your needs. With a focus on the unique attributes of each market, they identify innovative service improvements while embracing the philosophy of client advocacy. See more on how to get connected today!